We specialize in personal training, small group training and nutrition. Our exclusive customized workout program is designed by master level trainer Rich Opong, which you can follow on your own time at our 24 hour /6 days a week fitness studio. The workout program will breakdown which body part to workout and on what days, how many times per week, including recovery periods and days off. Our popular L .I . E. T program invented by master level trainer Richard Opong, is a unique style of training based on Low, Impact, Endurance, Training, without putting stress on your joints, while achieving maximum results. Clients have improved their balance, cardiovascular health, overall body strength, and lowered body fat. Nutrition is another important service we provide, including customized meal plans. 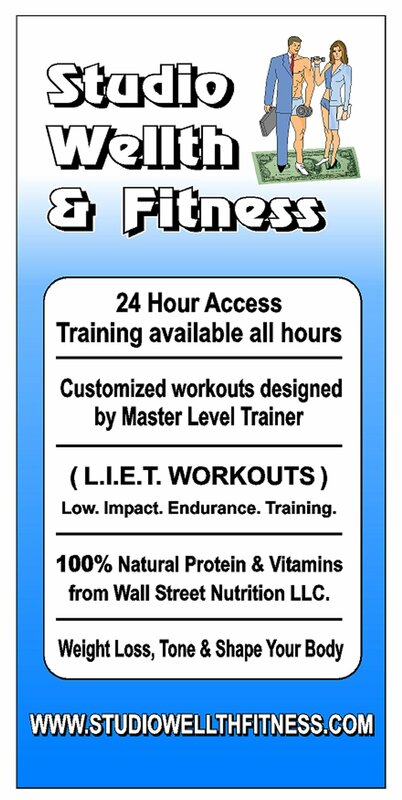 We offer 100% natural whey protein powders and vitamins from Wall Street Nutrition LLC . L.I.E.T. combined with Wall Street Nutrition products equals success. Our National Certified Personal Trainers have extensive industry experience. Trainers range from level (1,) 25 years +, level (2) 10 yrs +,level (3) up to 10 yrs , and level (4) up to 5 yrs. .
Visit our About us page for personal trainers background information, personal training fees and packages.